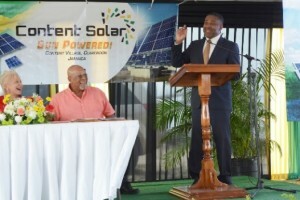 Marking a significant improvement in Jamaica’s energy diversity, Content Solar, a 20-megawatt solar energy electricity generation plant officially opened in Content Village, Clarendon Parish, on June 22, 2017. 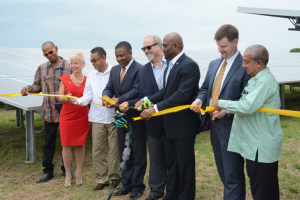 Ribbon being cut by (left to right) Councillor Uphel Purcell, JPS CEO Kelly Tomblin, MP Noel Arscott, Opposition spokesman on energy Phillip Paulwell, CEO of WRB Energy & Content Solar Robert Blenker, Minister Andrew Wheatley Minister of science energy & technology, Christian Redmer, the U.S. Embassy’s Political and Economic Counsellor and Mayor of May Pen Winston Maragh. 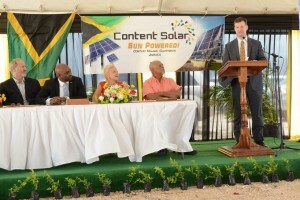 Citing WRB Energy’s decades-long experience in utility and renewable energy development in the Caribbean, Mr. Blenker noted that Content Solar is the culmination of three years of work to ensure that the project was well designed, well placed, and compatible with Jamaica. The project’s overall goal to increase renewable energy production cost-effectively and help stabilize electricity costs for sustainable economic growth. Both Andrew Wheatley, Minister of Science, Energy and Technology and Phillip Paulwell, Opposition Spokesman acknowledged the maturity of Jamaican governance shown by the seamless transition in the support for this important project. “I really want to commend us all for the tremendous way we run this place because Jamaica can’t progress if we have stop-starts whenever there is an election,” said Mr. Paulwell. “This project is turning heads in Washington … it is being held up as an example to follow”, said Christian Redmer, the U.S. Embassy’s Political and Economic Counsellor in his remarks as the US Embassy Representative. 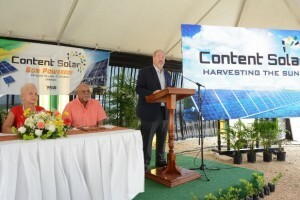 With an investment of over US $60million by Florida-based WRB SERRA and Overseas Private Investment Corporation (OPIC), Content Solar enabled the installation of more than 91,000 solar panels covering almost 160 acres in Content, Clarendon. Construction began in January 2016 employing four hundred Jamaican workers from the surrounding districts who learned new skills. The grid-connected solar plant began operation in August 2016. 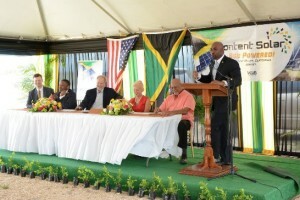 More than 150 people attended the opening which included representatives of local and international organizations involved in moving the project to completion, members of the environmental assessment team, Office of Utilities Regulations, other alternate energy partners and government and community representatives. 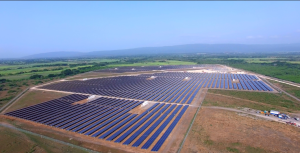 WRB Energy, WRB Serra and partner company WRB Enterprises (WRB) have deep roots in the Caribbean encompassing utility management, telecommunications, banking, real estate, renewable energy development and conservation. With more than three decades in the region, WRB focuses on long-term relationships and investments in national development while delivering high quality service to its customers and stakeholders. WRB has owned and operated electrical generation and utility assets in the Caribbean since the early 1980s and currently operates the public electric utility for the Caribbean nation of Grenada, where it provides fully integrated electrical services – power generation, distribution, metering, and billing – to tens of thousands of residents and businesses. 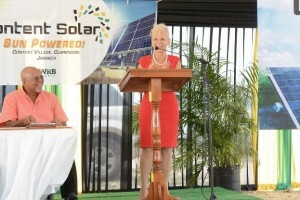 WRB also operated the power systems in Grand Turk and Dominica. Based in Tampa, Florida, WRB has built a stable asset base and a well-capitalized organization with substantial interests in community banking. WRB is one of the largest shareholders in both the Bank of Tampa and Center State Banks, two of the largest independent banks in central Florida. WRB Enterprises is a family-owned, privately held company with businesses focused on clean energy production, integrated utility operations, and community investments for more than five decades. WRB Enterprises has extensive experience in renewable energy development, financing, electric utilities, water treatment services, telecommunications, banking, real estate, machinery, and power generation equipment. For more information: www.wrbenterprises.com. WRB Energy, a WRB Enterprises partner company, has long-standing, proven experience in developing, building and operating renewable energy systems and integrated utilities throughout Latin America and the Caribbean. For more information: www.wrbenergy.com. WRB Serra Capital Partners is a private equity fund that invests in renewable energy, energy efficiency, and water infrastructure in Latin America and the Caribbean, with projects ranging from early-stage construction to commercial operations. For more information: www.wrbserra.com.